Life took a peculiar turn this week when news broke of the death of the much loved and celebrated children's author and illustrator Maurice Sendak. Only ten days previously the children's literature community here at Cambridge was celebrating the success of a memorable afternoon spent in the highly anticipated company of Norton Juster, author of 'The Phantom Tolbooth'. This year sees the 50th anniversary of that book's publication, and the anniversary edition opens (along with Juster's 'Introduction') with 'An Appreciation' written in 1996 by Sendak. For many of us, keen to revisit 'The Phantom Tolbooth' before meeting Norton Juster, this was to be the final contact we would have with the words of Maurice Sendak before hearing of his death. In his 'love letter' to Juster's book he wrote that he was, on re-reading it, "touched all over again by the confidence, certainty, and radiance of a book that knew it had to exist." Such a statement could surely be made reciprocally to Sendak's most famous book,'Where The Wild Things Are', itself due to turn 50 next year. Despite illustrating over 100 books and writing and illustrating over 20 in a career spanning over six decades, it's the tale of Max and his uncontrollable rage that has been the most frequent image used to represent his life's work in the many newspaper and television obituries that have told of Sendak's passing. Having sold more than 17 million copies worldwide, the book (and its cartoon, operatic, film and countless other versions), alongside the work that followed it, has provided children since the sixties with the opportunity to acknowledge their inner monsters and the darker side of life. This echoed Sendak's refusal to "lie to children" (a comment made in an interview with the Guardian last October) and to patronise them by sugar-coating life experiences. Reading the back catalogue of interviews which he gave, it is easy to see how his strong convictions towards many aspects of both literary and 'real' life had seeds sown in his own childhood as the child of Jewish immigrants from Poland in Brooklyn: as Sendak put it "and then you grow up and you do books for children". 'Doing' books for children was what he did extremely well however, as the many awards and accolades (including the ALMA and Hans Christian Anderson award for children's book illustration) that he received for his work prove; but ultimately it's the love of readers which speaks much louder than awards when it comes to making books grow beyond words and pictures on paper and card. That's why the world of children's literature - and of readers of all books everywhere - has felt the passing of Maurice Sendak so keenly. Through him we were able to recognise how the power of our own imaginations could help us escape the confines of society, it's rules and expectations to behave; allowing us to travel to distant lands and be who we wanted to be. In those worlds we faced no admonishment or punishment for our actions. We could yell, scream, behave badly and get it all out of our system; then, when we came home again, all would be well. Even now as an adult the three double-pages which illustrate the "wild rumpus" fill me with a sense of joy, fantasy and freedom. 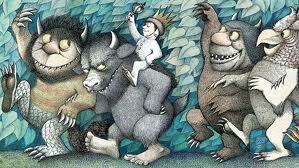 And as I shared the book for the first time with my three year old daughter this week, the way in which she paused my reading to devour Sendak's drawings in detail before turning each page suggests that she too recognised the magic held within. 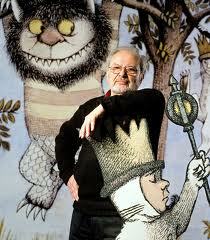 Last year Maurice Sendak was quoted as saying that he wanted a "yummy death" and that a happy death could be done. I hope sincerely that his passing was just as he wished, for our lives are all that little bit richer for what he achieved in life. Farewell dear King of The Wild Things!